Sitting in my Bed-Stuy apartment with Jolt Radio blasting and the cool breeze blowing through my open window feels oh so right. I've realized my mood is fairly dependent on the weather lol (my fave weather is the breezy and chilly variety [ l a y e r s ]). I think it's safe to say I have an addiction to the outdoors. I feel a tug to explore any nature trail that crosses my path and lord help me if I discover a nature center because I'll never leave. I've teamed up with Luxury Rebel to show you that outdoorsy wear doesn't have to be all khaki and army greens. 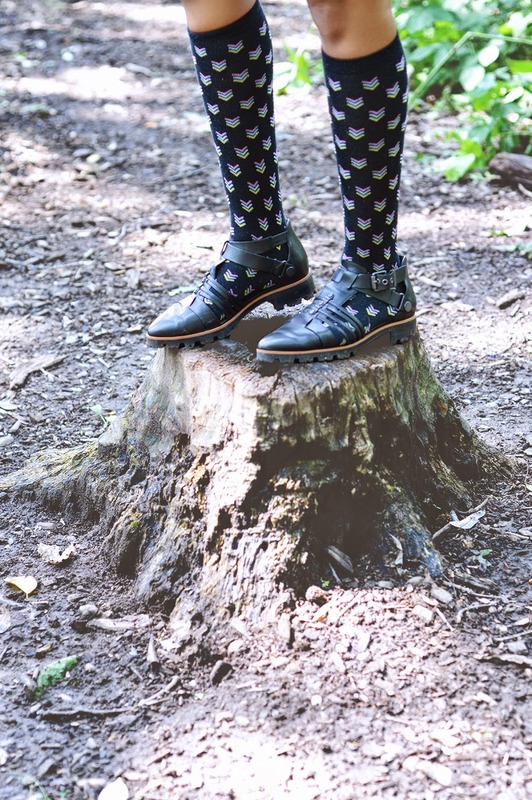 You can mix it up and show off your personal style while adventuring, even down to your trail blazing shoes. Their Grace sandals were perfect for an afternoon hike because they have good grip and are also really comfy. Not to mention how rad and industrial looking the construction of the shoe is. They're my go to adventure shoes and are perfect for impromptu Summer get a ways.